It’s one thing to write code from scratch, and another to edit key areas of existing code. For the latter situation, you can rely on Code Browser, a simple and intuitive app that allows you to access and edit source code files in an efficient manner. This friendly piece of software allows you to quickly structure source code, by folding it with markers or syntax. As a result, you can add new sections and copy various portions of code to them. 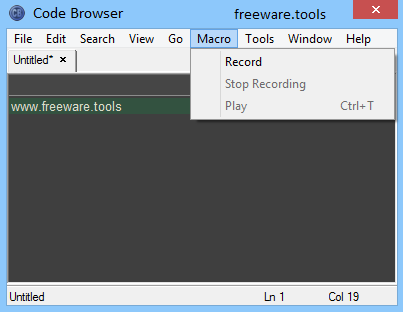 Code Browser lets you work with a wide array of programming languages and a file can be shown in several tabs. There is also support for syntax highlighting so you can identify errors with ease. Code writing is an essential part of software development and plays a key role in making applications work and run in a certain way. Code editors are important for programmers since a good product starts with a properly written code. Code Browser enables users to structure source code easier and faster. It does that by folding codes either with syntax or with markers. This enables a different method of structuring code and provides a better overview. Users can add new sections and copy different parts of the code there. The application offers support for a multitude of programming languages, a feature that makes it appealing to users who work with more than one language. This feature works well with the multi-tab capability of Code Browser: users can display a file in multiple tabs. However, the tabs cannot be moved around to change their order and split view isn't available either. Code Browser provides users with a syntax highlighting feature that allows the errors to be easily spotted and corrected. In addition to this, it offers a search / replace option that comes with match case, match whole word and regular expressions. The application offers both a global and an iterative search type, meaning users can search the entire code for all occurrences or just for repetitive lines. The application enables you to cut chunks of code and reference it either as a link or as an individual page. Users can customize how they view the code with several layouts that manage how the levels are displayed within. This feature proves useful since you can micro-manage what you are editing and prevents you from getting distracted. In conclusion, Code Browser is a worthy code editor that implements a marker-based folding and a unique navigation system. It can prove useful for beginners and professionals alike.